To disaster capitalists, Flint’s sick children present an opportunity for privatization and profit. While the tragedy of Flint’s poison pipes has shocked the public, the political drama unfolding in the backdrop may be a prelude to even more self-inflicted destruction through a one-two punch of austerity and privatization. That’s why libertarian and far-right think tanks are joining the media scrum along with liberal critics, as they lament the pathetic state of Flint’s government. Government-led disaster, to be sure, should outrage the public—the question is where to target the rage. The cruel calculation of risking public health to choose a “cheaper” source of water is less a product of bureaucratic incompetence than of a corporate mindset that monetizes human welfare. Flint’s crisis follows a global pattern of public resources’ falling prey to a profit mentality, which is why the poorest people pay more for water. In “underdeveloped” regions, multinational firms swoop in to capture the local market for water services—sometimes bankrolled by World Bank development schemes. Often this purported market-driven modernization leads to either unaffordable, unsustainable rates for residents, or to chronic neglect, pollution, and attendant public-health risks. Corporate Accountability International (CAI) has reported on the case of Manila, where a private provider has plagued locals with massive rate hikes and inadequate and substandard infrastructure. Conservatives gleefully blame “government” writ large for the water crisis. Now even in “First World” cities like Flint, austerity and privatization are parallel assaults on the commons. Jesse Bragg of CAI says via e-mail, “More and more, cities are being run like businesses, which often means unequal distribution of services and cuts for low-income communities.” Under the neoliberal development model, he adds, ratepayers are saddled with direct costs for the whole infrastructure, including treatment and maintenance functions that might otherwise be provided by long-term government investment. 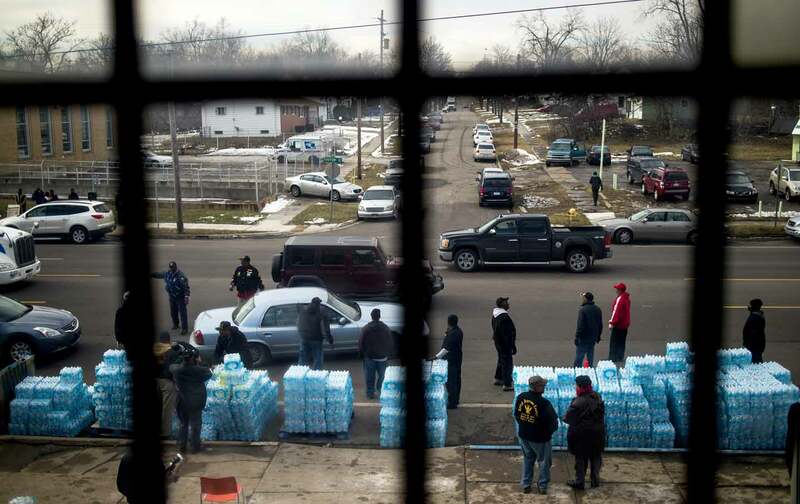 The nickel-and-diming of Flint continues even after the exposure of the city’s mass poisoning. Ratepayers have actually been charged for toxic water, under the doubly ironic threat that their dollars are now needed to finance the repairs that the city requires to make the pipes safe again. The warped logic of austerity runs through the entire trajectory of the Flint crisis, from Michigan’s initial push for austerity in 2010, which led to the installation of non-democratic emergency managers in Flint and other cities, to the fatal decision to switch to Flint River water, to the dereliction of duty at all levels of government to protect essential resources. But while it’s clear that the drive for austerity at all costs comes at the expense of public health, criticisms of the failure of the state can go both ways: While a progressive response to the Flint crisis would be to look to the underlying causes that led to the devastation of the infrastructure, right-wingers are likely to see Flint’s sickened children as a potential segue to a privatization campaign. As a collapsed auto town, Flint was the poster child for public-sector incompetence; years ago the libertarian think tank Mercatus Center cited Flint as a case study of why development schemes for cities are best left to free markets and not elected officials. Now conservatives gleefully blame “government” writ large for the water crisis. Heritage Foundation fellow John Seibler compared Flint to another recent water disaster, the toxic spill at the Gold King Mine in Colorado (caused by an engineering mishap by federal environmental authorities), arguing that it “may be another case of negligent government behavior that would raise criminal prosecution had it come from a private party.” In other words, he suggests the federal government supposedly gets a free pass while beleaguered businesses suffer unduly from pesky environmental lawsuits. Analysts said the problems in Flint—where residents have been drinking tap water with high levels of lead for years—may make it more likely for states and cities to give up control of municipal water utilities and place them in the hands of private operators. “For-profit companies have been talking for years about how they are better operators than municipalities,” said David Parker, an analyst with Robert W. Baird. “There are potential opportunities for these utilities to help. They have been in growth mode for well over a decade and have been upgrading their infrastructure,” he said. Privatization fever may be spreading nationwide; lawmakers in Wisconsin, Illinois, New Jersey, and Pennsylvania have proposed or passed measures to ease the privatization of water infrastructure. Atlantic City, also ruled by an emergency manager, is poised for a private takeover of its water system under a state Senate cost-cutting proposal. The apparent trend toward the market-based approach to public service is particularly disturbing in light of a countervailing political shift in recent years toward return to public control after years of failed privatization efforts, generally accomplished through remunicipalization campaigns led by public advocacy groups. Privateers have evidently been stalking Flint’s waterworks for a while. The city, amid rising public concerns about water hazards, contracted with the French water service multinational Veolia as a “consultant” on water quality. The company issued a report last February recommending some improvements, but gave the water an overall clean bill of health—in retrospect, another symptom of austerity’s cure being a double dose of the disease. Donald Cohen of the advocacy group In The Public Interest points out via e-mail that the role of the privatizer as benevolent objective “expert” is revealing: “Veolia’s expertise in this case is theoretically benign…hiring a company to one time testing and evaluation isn’t in itself a problem. But most of these types of contractors always seem to suggest privatization or outsourcing of pieces.” So when Flint’s emergency aid funds dry up, could private water companies coast in to finish off what austerity started? But the rage could also stir a grassroots political surge. In recent months, community activists across the country have joined global movements for water justice, demanding accountability from government and the human right to universal access to safe water. As perhaps the next battleground in the struggle for democratic control of the commons, Flint’s lead pipes are glaring proof that corporate rule and the public interest don’t mix.